This article was originally emailed as our monthly eBulletin at 11:30 on 14/01/2015. You can view older eBulletins here and register to receive them monthly. Despite unstable oil prices, global concerns about security and an upcoming General Election that will probably be indecisive, we think 2015 is looking very promising! As you can see below, there is plenty to look forward to and we shall be making further announcements throughout the year. We are returning to the NEC as exhibitors this year. We know that it’s hard to get round the exhibition between conference sessions so the most important stand you need to visit (ours!) is just inside the main entrance. 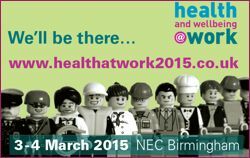 Update your diary now: Stand 109, Hall 8, NEC, Birmingham. March 3-4. We also have a handful of free delegate passes to give away. You can request one here. Our exclusive range of Occufit quality seating covers a comprehensive selection of hospital, clinical, laboratory and industrial applications. Because the portfolio is so extensive, we only have a few models on our web site. We are therefore producing a printed catalogue which will be available by the end of January. You can pre-order your free copy here. Although we are most widely known for specialist chairs and addressing musculoskeletal issues, we actually sell almost every type of workplace seating. 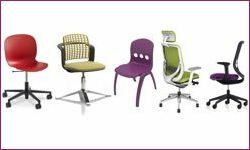 Whether you need office, control room, canteen, training, education, meeting room, boardroom or home worker chairs, we have a choice of suitable products to suit your budget. Our new seating brochure will also be available shortly. Click here to request one. 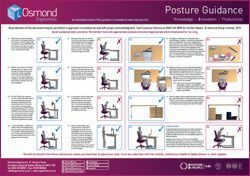 We have also redesigned our popular Posture Guidance Poster to include a sit-stand option and incorporate our current branding. It is A2 size in a landscape format and available free of charge. It is ideal for training rooms or general offices. Just click here to order your copy. You are currently browsing the Guy Osmond blog archives for January, 2015.